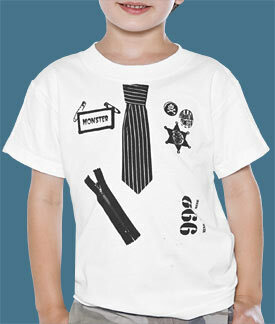 Prepare your little one for the working world with attitude with this awesome punker uniform t-shirt! This super cute white t-shirt features black screenprints of a pinstripe tie, a zipper, "999", a "Monster" name tag, a badge and buttons! 100% pre-shrunk cotton. Chest: Youth XS=28", Youth Sm=30", Youth Med=33"
Length: Youth XS=18", Youth Sm=20", Youth Med=22"